On Mother’s Day a year ago, I was staying in a house whose usual residents had gone to visit their mothers, leaving me alone to somehow cook a worthy breakfast for four extraordinary mothers—my own mother, my wife, a Venezuelan professor in exile and Elizabeth McAlister, the nun-turned-war-resister, an architect of the Plowshares movement with her husband, Philip Berrigan. This past Mother’s Day, Liz was in jail again. This past Mother’s Day, Elizabeth McAlister was in jail again. Our country’s nuclear weapons remain a clear and present threat to the survival of life on Earth. A valuable new film by Helen Young, “The Nuns, the Priests, and the Bombs,” depicts some of the other recent Plowshares actions. It also takes necessary pains to remind us why nuclear weapons are an abomination worth risking jail time to protest. I say necessary because those of us who came to awareness after the Cold War have been taught to only worry about the weapons of mass destruction that other countries might wield—Iraq, Iran, North Korea—while allowing ourselves to regard the far more massive arsenal at home as a benign relic. On the contrary, our country’s nuclear weapons remain a clear and present threat to the survival of life on Earth. And President Trump wants drastically more of them, even while he plays games of bait-and-tweet to compel other countries into disarming. Who gets to claim Dan Berrigan? Steve Kelly, S.J., who participated in the Kings Bay Plowshares action and others, also appears in Ms. Young’s film. “We cannot be fully human while even one nuclear weapon exists,” Father Kelly says. Several fellow Kings Bay activists appear in the film, including Catholic Workers Carmen Trotta and Patrick O’Neill. Watching the footage now, as Mr. Trotta and Mr. O’Neill mingle among Plowshares veterans, one wonders whether they had already decided they would be next. April 4, the day they entered the Kings Bay base, was the 50th anniversary of Martin Luther King Jr.’s assassination. In their public statement, they recalled Dr. King’s linking of “the giant triplets” of racism, extreme materialism and militarism. “We repent of the sin of white supremacy that oppresses and takes the lives of people of color here in the United States and throughout the world,” the activists said. They are speaking to us, I think—a generation whose schools have replaced nuclear-attack drills with active-shooter drills, a generation for whom drone strikes abroad are part of the normal background noise, as are police shootings of unarmed souls. They remind us that racism is as dangerous as a city-flattening bomb and that despite being out of sight, the bombs are as ever-present as micro-aggressions and mass incarceration. 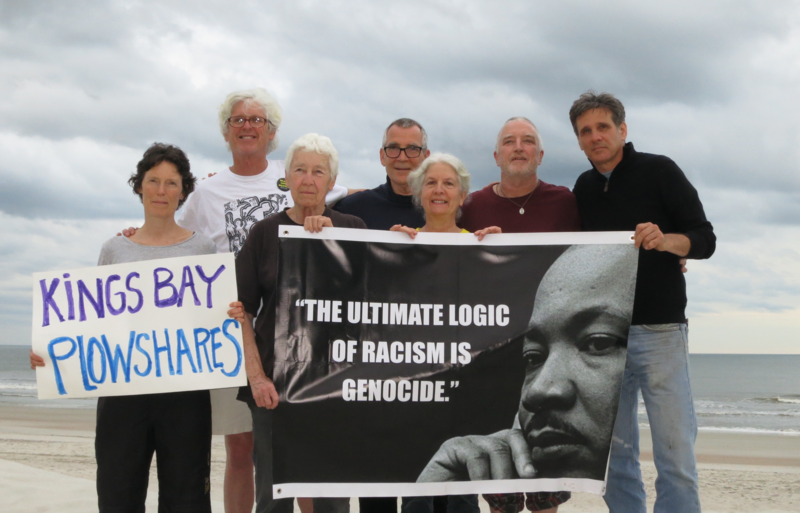 The Kings Bay Plowshares Seven remain in jail after more than a month. Is their jail time worth it? To see nothing happening; this makes no difference: so we are told by our sternfaced tradition, our Scripture, the voice of prayer, the voices of the great dead. The end is the means: this is the message, it and the medium are one. Little difference that the end is delayed, even beyond our lifetime (if indeed we are so fortunate as to survive the immediate years ahead). Keep at it, keep at it. The skies are adamant, the ears of the powerful turn to stone. No matter: keep at it. The postcards my family has received from the Seven, in reply to those we have sent, mostly contain the minutiae that keeping at it requires. Carmen Trotta notes that the food does not compare well to that in the jails of Honduras and Egypt and tells of being prayed over in tongues. Adds Martha Hennessy: “We are doing well but sure miss our grand kids.” It is the one from Liz McAlister that brings up the question of efficacy. There must be a word for it. Some can act self righteous about the evil of weapons while others must stand around with weapons protecting their lives. Otherwise they would be killed. It is extremely unfortunate that nuclear weapons exist but once they do, one has a moral obligation to prevent bad people from using them. Getting rid of all of our nuclear weapons is an invitation for their use not a deterrent. I assume the author and Sr Liz are all in on Trumps efforts on North Korea/Iran. As a pro-life moderate Republican, I very often disagree with the policies of my party, or which I became a reluctant member after being a long-time registered Democrat for more than thirty years. The author observes that "Kings Bay Plowshares Seven remain in jail after more than a month" then asks, "Is their jail time worth it? Absolutely. Years ago when I was in my late twenties (I 'm_now 56) I participated in a "rescue" ( peaceful sit-in) outside a center that performed the violence of legal abortion in Paoli, Pennsylvania. Unlike many of my fellow men and women who went to jail, I was a coward and merely paid a modest fine. Perhaps I was afraid that having a prison record would damage my chance of becoming a Special Education teacher, after having worked for some years for an agency that served disabled children and adults. Although I 'm not a pacifist, I certainly admire them for the courage of their convictions. I do favor war only as a last resort after all diplomatic efforts have been exhausted. I oppose the deliberate targeting of civilians, and strongly believe that it's horrendously immoral to use nuclear weapons. I admire the late Rev. Daniel Berrigan who favored a consistent -ethic-of-life approach. Father Berrigan opposed war, abortion, euthanasia, and capital punishment. He once years before his death was arrested while peacefully protesting outside an abortion center. Of course, Father Berrigan had been arrested and put in prison for anti-war and anti-nuclear weapons protests, while remaining a faithful (though radical) Catholic priest, for which I commend him. I agree with Professor Schneider that "Our country's nuclear weapons remain a clear and present threat to the survival of life on earth." I guess we can only pray that in the future, all nuclear powers will see the grave error of possessing nuclear weapons, and will dismantle/ destroy their weapons stockpile. However, with all due respect to the admirable efforts of those who rightly desire a world free of the threat of nuclear aeapons, now we have the worldwide violence of killing tens of millions of innocent unborn human beings by the violence of legal abortion. (An excellent, compelling book to read from the perspective of a compassionate obstetrician/gynecologist who isn't Catholic and who favors contraception as well as natural family planning is "Rites of Life: The Scientific Evidence for Life Before Birth" by Landrum Shettles, M.D.). Because of the U.S. Supreme Court 1973 Roe v. Wade and Doe v. Bolton decisions, the violence of abortion is legal for any reason up until the time when the unborn infant (or "fetus," which is latin for " young one ") is viable. There are almost 1 million abortions performed in our nation every year. It should be noted that "Jane Roe" in Roe v. Wade, who was Norma McCorvey who was the plaintiff in Roe who challenged the state of Texas law which provided legal protection to the unborn, never actually had an abortion, but released her infant for adoption. Although for years she not only remained an advocate for legal abortion and for a time worked as a "counselor" in an abortion clinic, she in time was persuaded by the consistent, compassionate witness of pro-life demonstrators outside the abortion center where she worked, and eventually came to believe that abortion killed an innocent unborn human being. She went from being an evangelical Christian to converting to the Catholic faith. A similar story is told by Bernard Nathanson, M. D., an obstetrician/gynecologist who in the early 1970's was a co-founder of what is now Pro-Choice America. Dr. Nathaniel in the early 1970's was the medical director in New York state for about 18 months what was then the largest abortion clinic in the western world. Dr. Nathaniel personally performed 5,000 abortions. He wrote an excellent book in the mid-1970's, "Aborting America" which I read. He in a very reasonable manner presented the arguments both for and against legal abortion, and though he came to realize based on biology, not theology (he was an atheist) that abortion killed a young human being, he favored legal abortion, though he did favor significant legal restrictions on the violent practice. Over a period of some years, Nathanson gradually came to favor restoring legal protection to the unborn (except in the very rare cases needed to prevent the death of the mother). I was fortunate to hear Dr. Nathanson give an excellent speech in the 1980's at the University of Delaware. Nathaniel over a period of years went from being an atheist, to an agnostic, to finally converting to the Catholic faith. As with admirable efforts against the terror of nuclear weapons, I believe that education as well as political efforts are needed to persuade people of the need to eliminate our Reliance on nuclear weapons. Sincere and vigorous diplomatic work is needed to end the nuclear powers possession of nuclear weapons. Similarly, while I firmly believe that our nation's laws must restore legal protection to innocent unborn human beings, those of us of many different faiths who are pro-life_must not only expand the number of alternative -to -abortion agencies, or which there are many hundreds nationwide, but must enact other laws and policies that make it easier for pregnant women to give birth. Such efforts would include paid maternity (and paternity leave), strict enforcement of child support, quality day care for working mothers, and equal pay for equal work. Finally, it would be beneficial to women as well as the larger society if sexual harassment and assault were taken seriously, and perpetrators of such crimes were consistently penalized.